So "Love & Hip Hop" has basically moved to a two week marriage counseling session on WEtv. The new cast of "Marriage Bootcamp: Hip Hop" is a whole ki-ki. We're setting our DVRs for this ish. The new upcoming season of “Marriage Boot Camp: Hip Hop Edition” will have the recovering-from-cheating and semi-struggle-love all up and through it. And we're here for it. 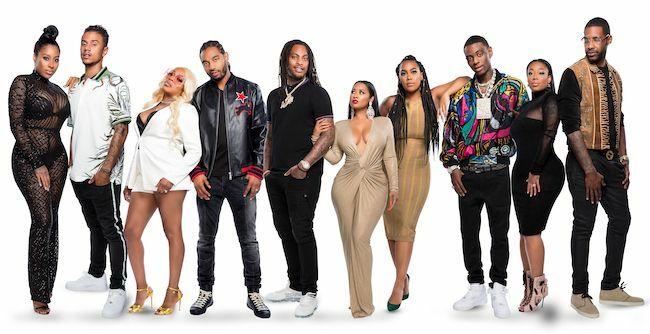 This season includes Soulja Boy and Nia Riley, Waka Flocka and his wife Tammy Rivera, Lil’ Mo and her husband, boxer Karl Dargan, Jessica Dime and her fiancé, professional basketball player Shawne Williams and Lil’ Fizz of B2K and Tiffany Campbell. Soulja Boy and Nia Riley have issues beyond repair, but the rapper actually wants to get married. Nia struggles to free herself from his control while caught in the crossfire of his vicious social media attacks. So yeah, a recipe for a disastrous relationship. Hip Hop’s Superwoman aka Lil’ Mo and her husband, boxer Karl Dargan are dealing with alleged infidelity too. Mo recebtly said she's leaving the music world to be a lawyer (chile...), but her man is still getting hit with cheating rumors. And Mo is putting alleged side chicks on blast. For “Love & Hip Hop: Atlanta” star, Jessica Dime and her fiancé, professional basketball player Shawne Williams, Boot Camp is their last resort. Apparently the baby and he ring isn't saving them. Shawne has yet to set a wedding date....in 2 years! Let the struggle love recovery begin! “Marriage Boot Camp: Hip Hop Edition" premieres Thursday, January 10 at 10:00pm ET/PT on WE tv.